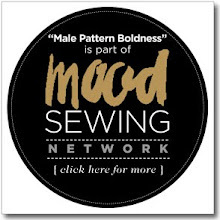 male pattern boldness: New Year, New Fabric, New Pattern, New Coffee! The reason is that I love the artwork, the instructions, and the small period-specific differences -- they really excite me. 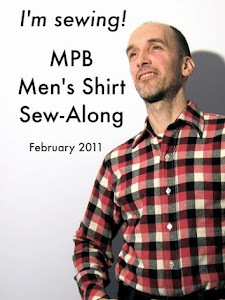 Vintage men's patterns are generally cheap and plentiful. I get a lot of bang for my buck. 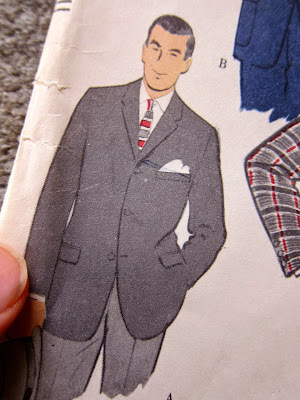 New for 2015 via eBay is Vogue 9445 (above), a men's "regulation" sport jacket pattern from 1958. What does this "regulation" thing refer to -- Do you know? 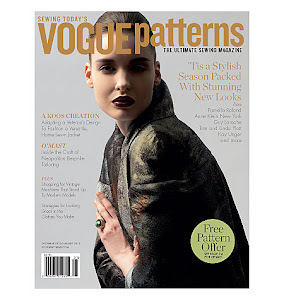 The pattern makes both a two-button and three-button lined jacket with pocket variations. Here's a peek at the instructions, which recall a vintage comic book. Lacking in my wardrobe is a wool suit. Am I ready to take the plunge this winter? We'll see. 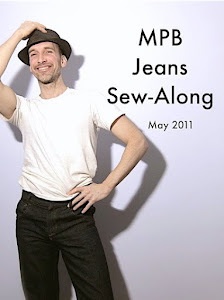 Not (necessarily) related to this project is this Theory-brand cotton twill I picked up last week. 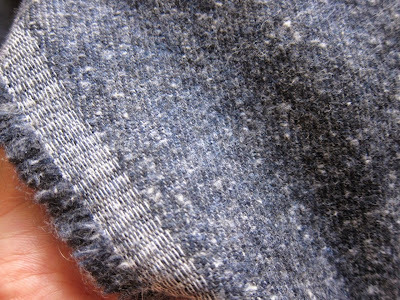 It's super-soft and slightly flecked. I have 5 yards: let the self-draping begin! Until recently, I had a strange method for making coffee. I'd use an aluminum "moka" Italian espresso maker and dilute the espresso with boiling water and milk so it was more like American coffee. But the result was a bitter brew that left me feeling overcaffeinated. 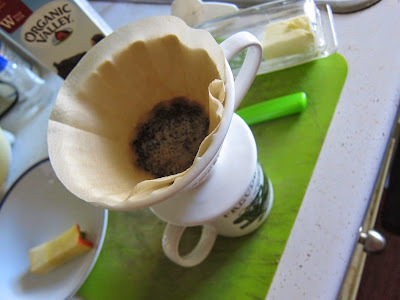 Since about a month ago, I have a new method: I purchased one of those ceramic single-cup cones that fit directly over your coffee mug and I use paper filters, which I first dampen with boiling water to keep the filter adhered to the cone. I use only enough grounds (coarser than those I put in the Italian Moka; I grind my beans myself) for a single-serving. Slowly, I pour water over the grounds, which releases the beans' "bloom" (or so I've read) and allows the water to pour through as much of the grounds as possible (if you add the water all at once, the grounds get distributed along the sides of the cone and the water doesn't pass through them). The result of all this is a cup of coffee that's more flavorful, less bitter, and in exactly the amount I want, with nothing left over to tempt me later on. Any tried-and-true coffee-making method you care to recommend? French press. So low tech. Good luck on the suit jacket. I tried one years (20?) ago for my son. Never finished it. booo! I can't wait to see what you have up your well tailored sleeve. 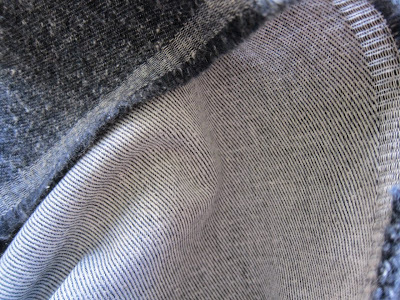 Also, that cotton twill is so lovely! Can't wait to see it made up. Since we came back to the States last year, we'd been using a French press, but just before the holidays we ended up kind of by accident with a Keurig, and I have to say I like it - one cup of excellent coffee with, as you note, a reduced likelihood of going on and having three or four instead. Also - great twill. Would look wonderful as a vintage-cut suit. I wonder why it seems a danger to end up with two or even three cups of coffee. And the blue is much more flattering on Micheal. But then, you know how to carry off the draping. vacuum pot! nothing else compares as far as i've tasted. Preferred is either French press or my old Krups espresso machine. However, for everyday ease, I use a Cuisinart with a gold filter and built in grinder. Personally, I think that the roast and freshness of the beans is more important than the method. I prefer a dark roast (less caffeine). FWIW: My coffee-loving brother swears that water that is between 196-198F makes a smoother, less bitter tasting cup of coffee than boiling (212F) water. It's more or less general knowledge here in the Czech Republic, unlike many other methods. I wonder how these develop, geologically? It might be a hard bean to find over there but my local coffee shop here in Australia only uses home grown coffee from Byron Bay. It doesn't have any "after burn" as I call it. I like the French press because I don't have to buy coffee filters. It is a pain to clean though. I love the cotton twill! Nothing like I've seen before. Can't wait to see the finished project! I have been watching that exact pattern on Ebay too! I love a 'regulation' jacket. Look forward to seeing what you do once again. My tried and true coffee method is to walk to the Italian bakery on the corner and get their Illy drip. Works every time. I bring my own cup for a discount and every 10th cup is free! French press and the trick to cleaning it is not to do so until the grounds are dry. 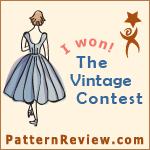 Of course you should collect vintage patterns! You're hanging on to a piece of history. (Don't make that plaid one, though...) As for coffee, for the 5:45 breakfast/school run, it's a Cuisinart drip machine, then a Nespresso longo after lunch to keep me from collapsing over the ironing board.And probably an after-dinner decaf Nespresso to survive 7th grade French homework. I use a stainless steel percolator and add some ground cinnamon and cloves in the filter basket. The coffee comes out very good. Plus, I came across a youtube video by Dr. Michael Greger saying that cinnamon helps regulate sugar in the blood. So yeah, I recommend you try some clove and cinnamon in your coffee, you might like it. 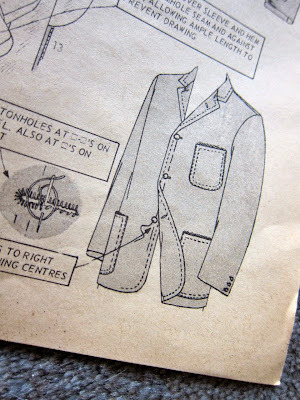 I must look into buying some men's vintage suit sewing patterns online. Thanks and Happy New Year! I considered getting a big, fancy Italian espresso machine and settled for a KitchenAid. It makes actual espresso, not just strong coffee. I then add hot water for an Americano, a little cream, and I'm good for about 4 hours. I also got the burr grinder, the extended steam attachment, the special froth pitcher... When I don't have time for espresso, I too use a Cuisinart drip machine. Hmm. This is like sewing machines. Love the twill, the pattern, and the pictures. 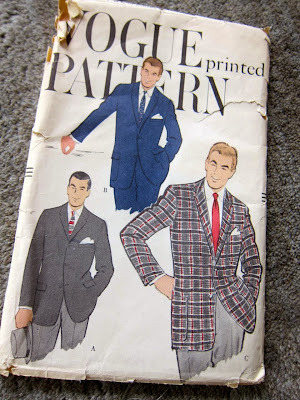 I would really like to see what you can do with a suit pattern, especially in wool. Please -- do it! 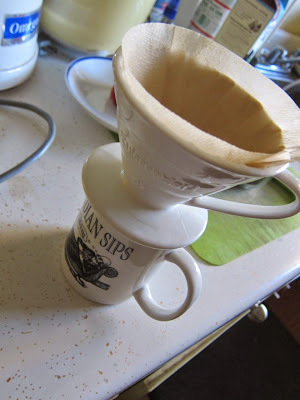 I use a drip pot for more than one, but I use a single drip cone for just me. I also use a press pot sometimes. I grind my coffee with a burr grinder. I am not a big fan of Americano; it's not full bodied enough. I like the fabric. From Mood? Turkish coffee. The smell and taste around beautiful memories for me. I use the Clever coffee dripper. It allows the coffee grounds to soak until you open the valve on the bottom by placing it on top of a cup. It's as if a French press and your filter holder had a baby. The Bonavita is the same idea but nicer because it's ceramic. We drip in the same method using a Hario ceramic (and keep a plastic on hand for travel) - pouring over into a Japanese (Zojirushi) carafe that allows the coffee to stay hot all day. We use a blade grinder, so sometimes hand grind with a burr grinder. This allows us to taste and sample (and really enjoy) locally sourced recently roasted blends. And, agree it removes the bitterness in most coffees! Freddie looks like such an old soul in that picture. Rarely a coffee drinker, but if I want an eye-opener, there are many convenient Speedway gas stations in the area, which offer plenty of ways to personalize one's cup, while rubbing elbows with a savory and unsavory assortment of central Ohio folk. Clean up's a breeze! Bpfffffff! My teen son is a barista here in Snobby Seattle and they are so over the pour over! There's a new schmancy way to make your cup every other week. I am waiting for the percolator to make it's way back: I still own one! What I want to know is: is the Clover coffee machine any relation to my clover seam ripper? For my one cup of coffee of the day it has to be good. So over the years I think I've tried every system created. Now I'm back to the simple cone and paper filter like you. Having the water off the boil does help avoid any bitterness as I like a dark roast, either ground with my electric blade or hand with a burr grinder. Then of course there are all the different systems for travelling depending on whether I'm in a vehicle or a kayak! Enjoy. I lived in Italy for 4 years and was converted to the only way to make coffee- using an Italian mokka. No other way was acceptable, believe me! Any way it is good at what it does, but I use Italian Lavazza ground coffee in my one admittedly quite large cup of coffee per day. 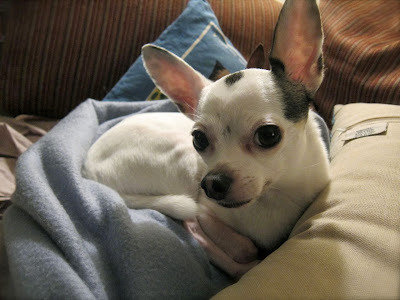 Looking at your photos, I think the decision has been made for your fabric- a comfy cosy dog bed, by the looks of it! We use a Cafetiere (is that a French press?) and have perfected the art of adding exactly the right amount of water for just two cups of coffee. I chuck the coffee grounds onto the garden, it seems to like them! There is only one right answer here. French press. I use a Bodum brand press (about $25 in Macy's Cellar, I think), and it gives the best quality for daily use. Easy to clean, no effort whatsoever. I used to do a mesh strainer with a filter over a cup, timing the "bloom", and that was great for taste, but a bit more time consuming and a bit more cleanup/organization/tools than the press, which is effortless. My brother owns a coffee company, so I've tried everything. This Christmas, I was given an expensive contraption, which I will use, because I have to, but I assure you, the simple way is the best, especially for the daily drinker. And while I appreciate the gift, I really didn't want any more machinery to clean, or wipe down. After living in Europe for some years, we bought an espresso machine that makes espresso or regular coffee. I love it because it has the milk steamer and I can make cappaccino for myself. I'm also a concert to the pour-though-cone and fresh ground beans. You seriously can't beat it for flavor and it's just so easy! I have a question for you, if you have a minute.... Mr. Sew Rachel has been asking for a sport coat, and I'm a little terrified by the task! Any suggestions for a good pattern for a beginner if menswear and tailoring? Thanks! 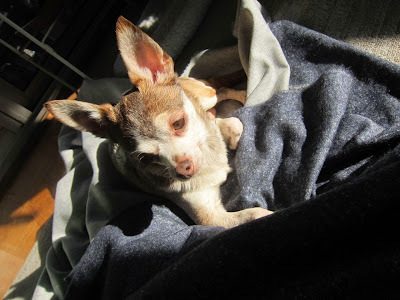 I live reading your blog! There are some in-print Vogues that look promising, but I haven't used them myself. I generally use vintage patterns from Etsy or eBay. 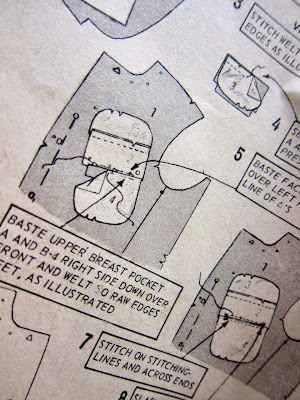 You just have to know your chest size as most old patterns (with the exception of Kwik Sew) are single-sized. I love the artwork on those old vintage patterns too! I use almost the same equipment as you do my cone looks a little smaller though - just the size of a #2 filter. My method is a variation though. I've read the 'bloom' thing, and I'm sure it's fine, you could do a little 'bloom' pour first if you like. Anyway, my method is to fill the filter all the way up, and yes, the coffee does come up the sides, but here's the important bit, let all of that water drip down. Then I fill it up completely again. This time the coffee falls back down to the bottom and this water spends a little more time in the coffee. This seems to be exactly the right amount of coffee for my mug so I'm happy. I once got a job based on my ability to make good coffee with this method so I'm sticking to it! YES! But I didn't know that was a "technique". I would make coffee for my mother and she wanted to know how I made the coffee so good. I told her I was just playing with the coffee grounds by the technique you described. Maybe there is a fancy name for this technique. If not, one needs to be made up. I LOVE the buttoned up high look of the 3 button suit. I hope you'll decide to make that one. As for coffee-making...I agree, the French press is the best way. No paper needed, save a tree. Grind really coarse and get a delicious cup of coffee every time. I found a wonderful olive green ceramic French press at my nearby thrift store. $8!! Nice pattern, nice fabric. I like French press coffee, but don't make it all that often for some reason. I also have a Mr. Coffee latte maker which I really like. It doesn't make a true latte--it doesn't steam the milk, so I guess it's more like a cafe au lait. But it's good. My main coffee ritual is that I like to linger over it, so if I have to drink it and run, it makes me kind of mad. I'm not a morning person at all, so this happens a couple of times a week. That pattern! The illustrations are gorgeous! I want one, just to look at it! I'm a Chemex girl when it comes to coffee... it's a similar process (paper cone, I wet the grounds to let them bloom, then pour the rest through). Mine is big enough that I can do two cups if the fella is home, but we usually eat breakfast at different times so I make just one cup for myself. It's much less bitter and easy to clean. I love my brikka coffee pot, which is a variant of a moka pot that make it more like true espresso. It took some experimentation to get it just right without bitterness but once I mastered it there was no going back to anything else. That baby even goes on vacation with me! I'm not a coffee drinker myself, but this blogger swears by cold-press coffee. It may be worth a try. I'd never question the buying of more patterns by anyone else. The only reason I question mine is available storeage space. When it comes to coffee, I only have 1 per day (a second is a special treat). I'm to foggy brained in the morning to use my preferred method - a cafetiere (stainless steel italian percolator). After killing 2 of them I stick with my french press. As a confirmed coffee-holic, I have to say, like sewing and sewing machines, there is no single “right” method. It all depends on personal taste and preferences. I’m sure a large part of that has to do with experience. I mean, I used to turn my nose up at a lot of foods when I was a kid that I have grown to love. French presses, Italian moka, and various other stovetop expressos, big and little expresso machines, with and without steamed milk, Chemex drips, Melitta drips, generic drips, and even old fashion percolators. I have had them all. Today… I am almost embarrassed to admit that I have become a Nes****o addict, although in my behalf, I can say that I use primarily free trade organic capsules that are now available, so you don’t have to follow George Cluny or Penelope Cruz to the N*******o “temple” to buy your coffee. It is almost like they put some designer drug in the original capsules to get you hooked. (Sort of like the original colas.) I know fanatic buy-only-just-roasted-fresh-beans-and-use-immediately types who have tossed out their grinders and would sit on the curb and beg for capsules if they had no other source. Shameful. I am sure my free-trade capsules are the only thing keeping me from being struck by lighting. 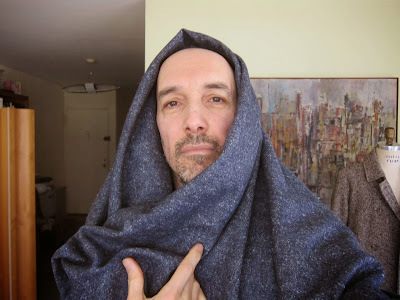 Peter, the twill fabric-see if you can get a Marfy pattern. Make sure you know your size-there are no instructions and I'm confident you could pull off Italian style! Wool suit-avoid black. You want some jewel-tone colour or find a good blue-grey tone to get that suave vibe! 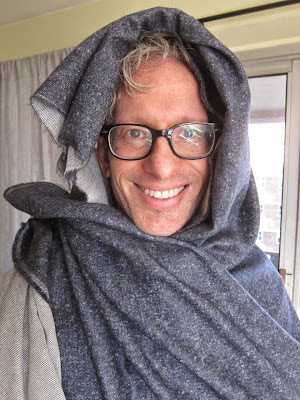 I too have my hair more white/salt& pepper than brown yet I avoid black fabrics near my face. Colour can be a good thing around the neckline/face. Same rule applies to glass frames-go for colour, not black or grey metal. I prefer metallic brown. 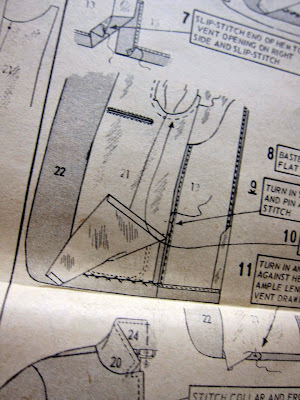 now .. for my big question, does anyone know x-y pattern grading ... so vintage patterns and many are in one size .. so to scale up .. i know there are standards, rules .. computer programs use them .. is there anyone that could help me size a vintage jacket pattern in size 44 up to size 50? 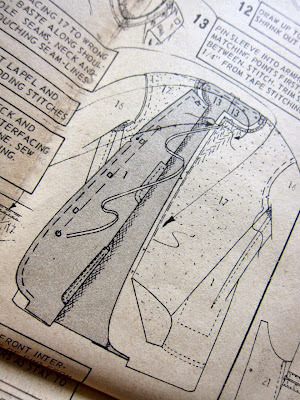 Love the Jacket pattern just for the illustration itself. Now for the coffee. I rather toss the beans up in the air and on the way down blast them with a flame thrower!! I watched a Japanese show on Starbucks black apron baristas, and (in Japan) they hold classes on coffee. That's how they brewed the perfect home coffee. I have yet to try it myself (I am a tea person). Cant wait to see the suit Peter. Will you show us progress of the suit jacket and pants? I love my Keurig. So convenient and great coffee, but I am not a purist, so there is that. Keurig here also. DH gets up hours before me, so when we had a regular electric coffee maker, it was hours old. I hated it. And most of the pot was wasted because it was too complicated for him to make a partial pot. So now it is the Keurig. We can make however many cups we want with no waste and everybody gets a fresh cup. "Moka" coffee makers don't make real espresso, just good, strong coffee. Espresso requires steam applied with a certain amount of pressure. Happy New Year, Peter! I love pattern artwork, too. 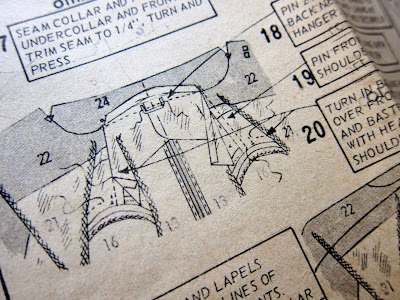 That pattern and instructions are gems. Regarding coffee, I seem to get the same tasting coffee no matter what pot/method I try. I like your ceramic cone. I have a sensitivity to epoxy, so no heated plastic for me. 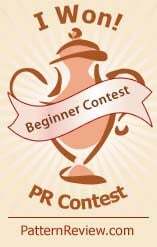 I use a stainless steel electric percolator. Having to make multiple cups is not a problem. I would hook myself up to an IV for coffee if I could. 'regulation' jacket i am also like this jacket. but i always design my suit and shirts from Cutnstitch, and in this new year i am going to try some thing new design.